A walk through Cheltenham’s Promenade area is not complete without a quick glance over at the Neptune’s Fountain Sculpture. This area of the town is incredibly popular with visitors and locals alike who have found their perfect property in Cheltenham with the help of Estate Agents Cheltenham based. The Promenade is full of high end shops and boutiques as well as cafes and bistros. Conveniently the main bus routes also terminate along the main road through this area of the town. 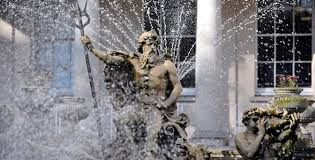 Neptune’s Fountain can be seen outside of the Municipal Buildings. It depicts Neptune (a Greek God) sitting in a chariot made from shells that is being pulled by four sea-horses and alongside stand merman playing conch-shell trumpets announcing the arrival of the God of the Sea. This is a typical image of Neptune and he is often seen riding in a seashell chariot that is pulled by a variety of different sea creatures from seahorses through to dolphins and turtles. As is always the case with the God he is hold his Trident clasped in his hands. It is said that this Trident is what holds all of his power and it can be used to command the sea. There are many stories in which enemies of the Gods and jealous rivals try to steal the trident away from Neptune. The Little Mermaid franchise is based around the stories and the myth of Neptune and his daughters. Its origin in terms of the inspiration taken to create this incredible fountain is unknown and stories have stated that it has been linked to Trevi Fountain in Rome and also the Piazza della Signoria in Florence. Regardless of the muse that was used to create this piece it is probably safe to say that it was Italian in nature. The piece was created by Joseph Hall who was an engineer and was finished in 1893. It was sculpted from Portland Stone by Richard Lockwood Boulton and his sons. It was thought that it was commissioned as a piece to help bring vibrance to the Premioneade area in a bid to see more people visiting this area of the town. 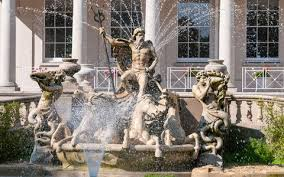 The water that is channeled into the fountain comes from the River Chelt which culminates in the Sandford Park. It runs underneath the Fountain and funnels through the design and produces an incredible display of water. In 1989 it was decided that the Fountain was in great need of some tender loving care and it underwent a complete restoration project. It is cared for and maintained by teh Borough Council as one of Cheltenham’s iconic pieces that demonstrates the Spa town popularity of the past. « Hubble bubble cauldrons are trouble.